The video above explains the problem of shared decision-making. Everyone says they want shared decision-making, but no one can actually do evidence-based medicine with shared decision-making in a universal way, for all treatments, for all diseases. Thus, we created the Treatment Scores system to make the process transparent and visual. What is your illness? What is the list of treatments? 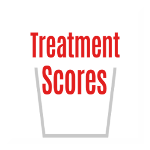 And, what is the Treatment Score (the net treatment benefit) for each and every treatment? Crucial Decisions - Patients Need Help!